David is an Australian artist living in Brisbane represented by galleries in London, New York, Tokyo, Hong Kong, Singapore, Melbourne, his home town Brisbane and other cities. He paints in oil and acrylic in a contemporary impressionist style. His work is representational and figurative. David is an Australian artist represented by galleries in London, New York, Tokyo, Hong Kong, Singapore, and with Wentworth Galleries in Sydney. He paints in oil and acrylic in a contemporary impressionist style. His work is representational and figurative. Since his first solo exhibition in 1976 in Toowoomba Australia at the age of 21, David has had more than 60 solo exhibitions including paintings, sculpture and photographs in locations around the world. Australian Artist David Hinchliffe has been painting, exhibiting and selling his work in galleries since the age of 12. He has won numerous competitions as a young artist (Sunday Mail Art Prize, ABC Argonauts Award, Atlantic City Sculpture Award, Toowoomba Gemini prize) and is a regular finalist in Tattersalls Landscape Prize. 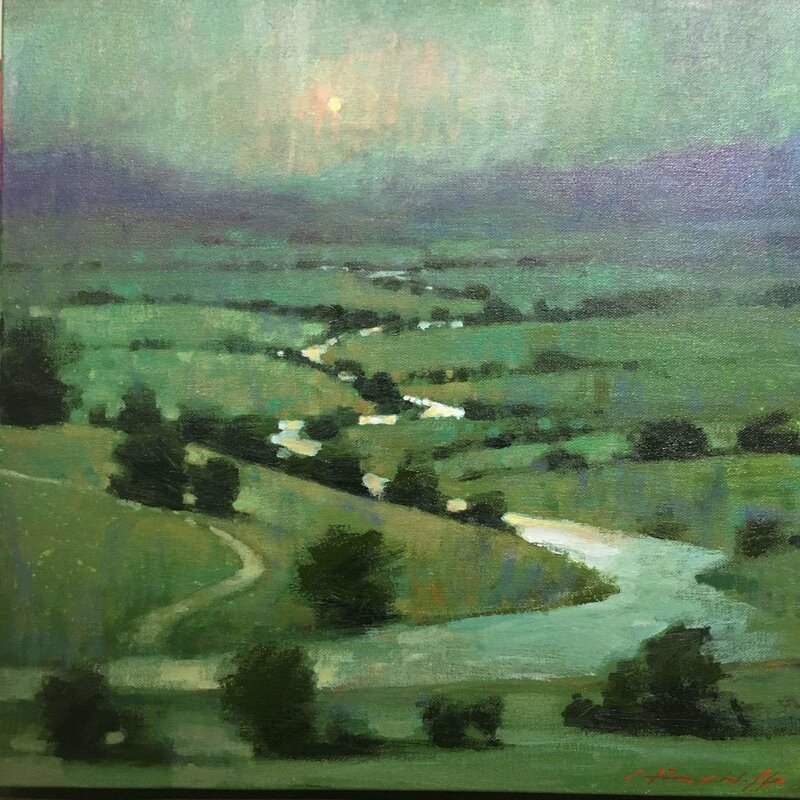 David has travelled and painted widely in the United States and UK and is represented extensively in collections both in Australia and overseas. While his work is principally oils on canvas or linen, he has also produced many gouache works and sculpture as well as holding two exhibitions of his photographs (“Two to the Valley, 1992, and “Detours”, 2010). His style has been described as "contemporary impressionism". He trained under Brisbane artist, John Rigby, painting as a teenager with contemporaries Tomas McAulay and Rex Backhaus Smith and also studied under premier Australian landscape artist and Archibald prize-winner, William Robinson at the University of Southern Queensland. David furthered his practical artistic study in both New York, Paris and London in the 70s while working his way around the world painting portrait commissions until he returned home to pursue a career in politics. He has painted portraits of former Premier Campbell Newman, Poet Bruce Dawe, Prime Minister Malcolm Fraser , actor Bryan Nason and businessman, Sir Alex McKay. Described by the late Australian Artist James Gleeson as having an "exceptional talent", he has emerged from 3 decades of work in the public domain to return with renewed passion to his career as a painter. He won the Sunday Mail Colour Magazine Award (1972), Atlantic City Sculpture Award (1973) and Gemini Art Award (judged by James Gleeson in 1974) and has been a finalist for the last 6 years in the Tattersall's Landscape Prize. He has exhibited at galleries in Brisbane and the Gold Coast as well as at Harrods in London and at Village Art gallery in Greenwich Village 1996, at the Australian Consulate, New York and at Michael Ingbar Gallery on Broadway in Soho, New York and Paris.